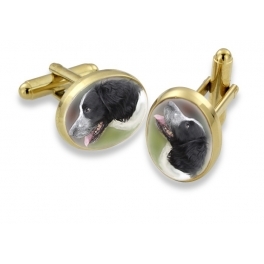 Swivel type cufflinks for the discerning gent! These cufflinks can be inlaid with a photograph of your horse or dog inside the oval frame. Perfect for any occasion, they make that unique gift you’ve been looking for, for the man who has everything! Available in a choice of sterling silver, 18ct gold plate or 9ct gold and measuring 18mm x 13mm, they come presented in our black leatherette presentation box.